Expressions of Interest (EOI) are invited from creative industry professionals and aspiring lighting practitioners from Australia and globally to present outstanding creative concepts for Vivid Sydney’s 2015 light program. 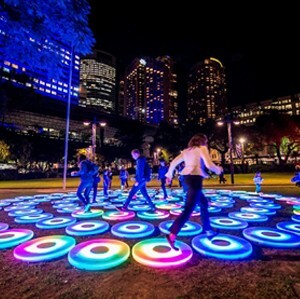 NSW Deputy Premier and Minister for Tourism and Major Events, Andrew Stoner invited Expressions Of Interest (EOI) for this key creative component of the Vivid Sydney festival, which was attended by more than 1.4 million people this year. According to Mr Stoner, Vivid transforms Sydney each year into a colourful canvas from the Sydney Harbour Bridge to Martin Place and the iconic Sydney Opera House to the harbour. The event attracts visitors not only from the State and throughout Australia but also from around the world. Vivid Sydney offers a global platform for creative lighting professionals to design installations or projections and showcase their talent to the world. The Vivid Sydney 2015 Light EOI covers four categories: Projection Icons including Customs House and MCA; Illuminati Buildings giving artists the opportunity to change the skyline of Circular Quay; Heritage Facades scattered throughout The Rocks; and Lighting Sculptures and Installations, which will once again line the harbour foreshore between Sydney Opera House and Walsh Bay. Destination NSW Chief Executive Officer Sandra Chipchase thanked the international creative and light industries for their outstanding support for the festival. Vivid Sydney is owned and managed by Destination NSW. Vivid Sydney 2013 won Australian Event of the Year and was recently announced as the Helpmann Awards 2014 Best Special Event recipient. Vivid, the largest festival of light, music and ideas will illuminate Sydney again from 22 May to 8 June 2015. Expressions of Interest to participate in Vivid Light 2015 close Friday, 3 October 2014.